Is There Such a Thing As Too Shabby? I remember when I first started accumulating distressed furniture and accessories. My children worried that we were poor. Truth be known, we certainly were not rich, but not poor either. 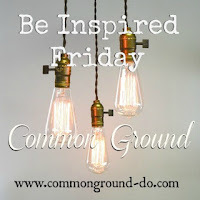 I liked a coordinated, but not perfectly matched home. The look that you get through years of collecting, and not buying the matched sets of anything. After being inspired by the gardening book "Garden Junk", written by Mary Randolph Carter and also magazines, I adopted a garden junk theme of my own. Over the weekend, I was taking my garden junk out of our shed. I hadn't yet disbursed it to various parts of our yard, and my gardens, and I was kind of taken aback at how my precious "junk" looked pretty junky. Without pretty flowers, green grass, and green leaves on the trees, my prized possessions looked dingy and depressing. This old wooden ironing board got a facelift. My first purchase of bedding plants in the wheelbarrow and ready for planting. (I will eventually buy at least two to three more wheelbarrows full). It's all coming soon as warm weather comes to the frigid northland, finally. 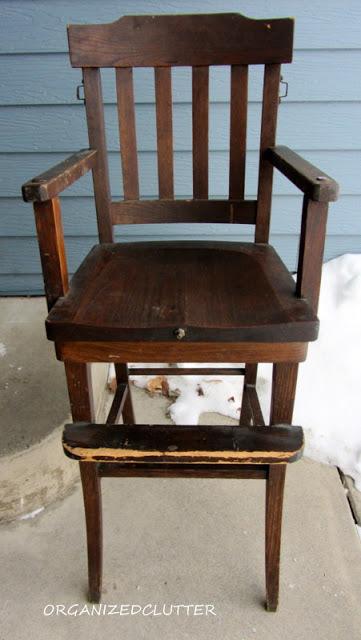 You have to come see my post on garden junque! All your items are treasures...they look great! 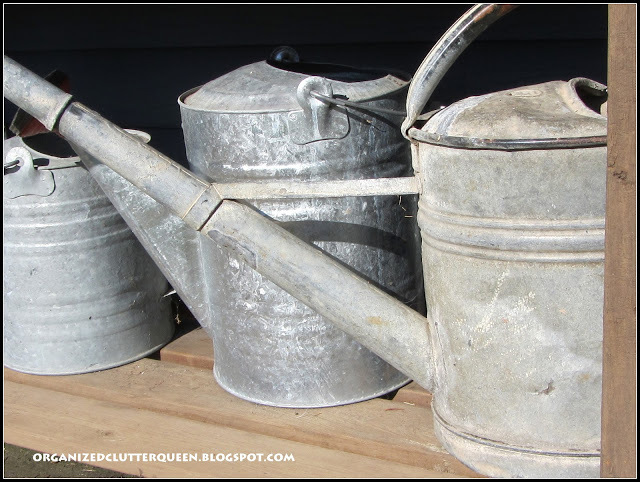 My first foray into blogs was by way of visiting a Garden Junk forum on the Garden Web :-) I love your junk Carlene and the spruce ups you have done is just right! Sending warm temps your way!! Your comment about what your kids said made me think about something. What's up with that house? It looks like an old farmhouse. I know they didnt mean it as a compliment but when my realtor told me, I got excited and said Yay! I'm doing something right. LOL! Oh beauty is in the eye of the beholder. Looking forward to you garden decor again this year! It's amazing how a little paint brightened everything up. Looks good! I have some stuff you can paint if you're getting bored up there! Can't wait to see everything put together. You've got a jump start on gardening, Carlene! I haven't done a darn thing yet, or even bought a single plant for myself. Maybe the warm weather will get me going before all the plants are bought out. I love all your garden "junk"! What a lovely garden! 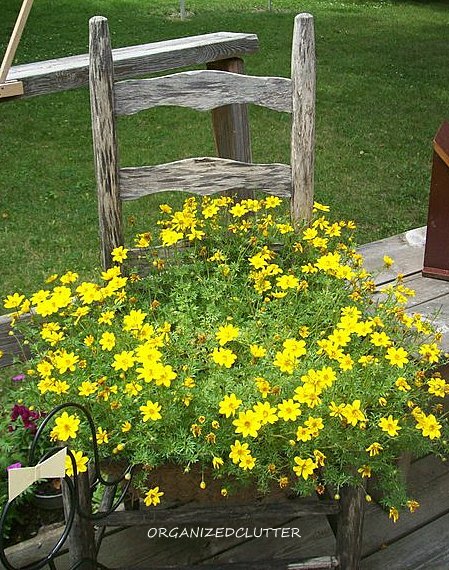 I love using chairs and other odd household items in my garden. The chair with coreoposis is gorgeous. Your touching up looks good. 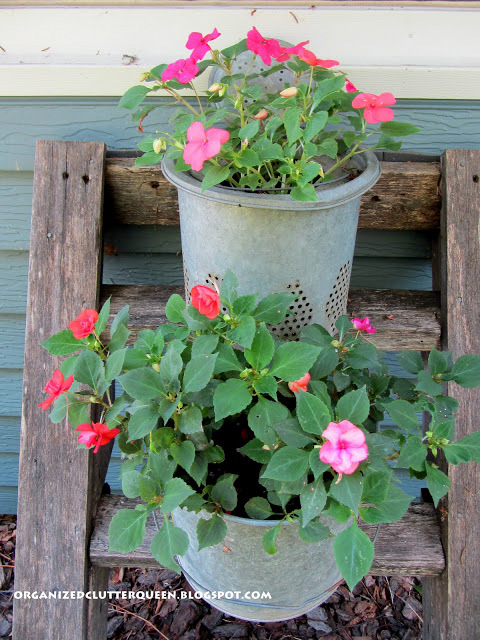 Love all your "garden junk", especially the wheelbarrow! I've read several of Mary Randolph Carter's books- such inspiration to be found. You have me inspired Carlene! I was cleaning up my outdoor collection of lumber and made a 5' x 6' garden gate with some truly weathered planks instead of dumping them. Looks pretty good, but don't know where to put it. Waiting to see your lovely gardens. Love all the pieces that you painted. Everything looks great!! Can't wait to see your gardens when everything blooms. Looking good!! Things look a little like a "junk yard" here :) I think I need to do some "refreshing" too!! Enjoyed all the photos. I sometimes have a hard time trying to decide if something I like is vintage and cool - or if I'm deluding myself and it's really just junk. lol I think it's all in the eye of the beholder, isn't it. And I love the sprucing up you did to your objects! 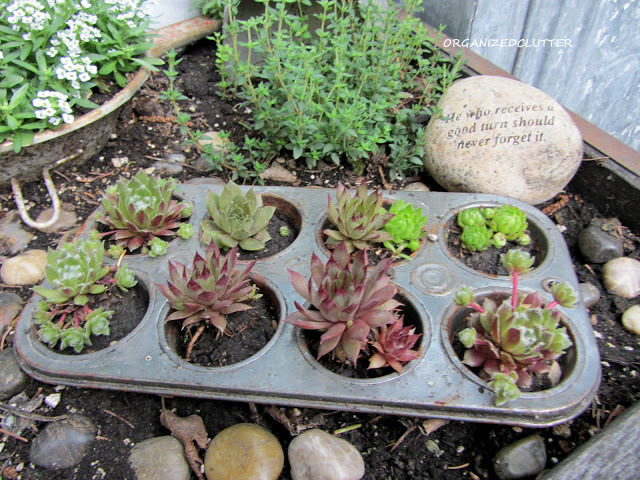 It all looks beautiful - I'm loving that muffin tin filled with succulents - just brilliant!!! I love that wheel barrow!! The chairs are great too. The update you did on that headboard piece and ironing board came out great. You have such a great collection!! 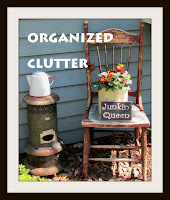 I love your 'junk' for the garden and think the few things you freshened up look wonderful. I've got a few junk things on my deck for sure! Some of my garden corners still look pretty junky too. I've slowly been trying to get them all filled as well as I can. They sure would look better with a touch of paint as well. It's amazing how a dab of paint can spruce up a piece...and protect it from the elements. Your flowers look great. I planted a flat of impatiens a couple of days ago. Love them..they're such good doers. I love the fresh makeover for your garden items. Happy spring. I'm looking forward to more junk gardening! Looks awesome Carlene! I really love the muffin pan with succulents in it. Carlene, I often think my yard art looks a little junky until the plants fill in. Then I love it! You always make everything look fabulous! Oh you scared me for a minute there Carlene. I thought you were going to paint everything! Please tell me that all of your snow is finally gone! It's wonderful how white pulls everything together. I love that little succulent muffin pan idea! Really, really cute! I've had a wonderful time looking over your blog. We recently moved to the country and currently we are finishing up a....well hopefully....a rabbit barrier to keep the cuddly creatures out of our gardens! I have an old sink like yours that hubs made into a potting bench - and it was just soooo much fun to see yours all prettied up! I love the geranium sign - and I might have to make something like it - but, what I really love is the little aluminum fairy garden - with the ice-cube tray and the measuring cups! Oh my goodness. I think I will be spending lots of time on your blog!